Patent document from the Department of the Interior United States Patent Office for a Mine Trap Door issued in 1907. This historic document has a vignette of the Department of Interior Seal. 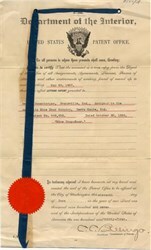 This item has the signature of the Assistant Commissioner of Patents and is over 100 years old.